A newspaper article about the 1988 Heritage Jubilee Distinguished Service Awards. The Heritage Jubilee is sponsored by the Afro-American Society to honor the birth and achievements of Dr. Martin Luther King, Jr. The program was established in the early 1980s by students and faculty members at Seminole Community College. The committee also created the Distinguished Service Awards, which would highlight the achievements of local African-Americans. One of the honorees for 1988 was Marie Jones Francis, the "midwife of Sanford." Francis left behind a successful hotel and restaurant she owned in Sarasota in 1942 to return to Sanford and become a midwife. World War II caused a shortage in doctors and nurses, so Florida's Children's Bureau sent Francis to Florida A & M to acquire her practical nursing license in 1945. She specialized in premature babies and returned to Sanford to aid her mother, Carrie Jones, at Fernald-Laughton Memorial Hospital before they opened the ward in their home. "When her health starting failing," she recollects in a newspaper article, "I took over." Francis converted her house at 621 East Sixth Street to also serve as a maternity ward, where she delivered over 40,000 babies over her 32 year career. She became a midwife in the same vein as her mother, Carrie Jones, and together they ran the Jones-Francis Maternity Hall in Georgetown. Francis served her community in several ways. She delivered babies for both white and black families from Seminole County, primarily patrons who either preferred natural births or could not afford deliveries at a hospital. In the 1950s, it cost $70 to stay nine days where soon-to-be mothers were taken care of. Francis was assisted by her sister, Annie Walker, who did the cooking. The house and ward also served as a school, where Marie Francis taught nurses the art of midwifery. Nurses would come from across the state to learn how to delivery infants naturally. A heavy burden on a single working mother, Marie Francis had three daughters, Cassandra Clayton, Daphne Humphrey, and Barbara Torre. Clayton and Humphrey became school teachers and Torre became a purchaser at Seminole Memorial Hospital. 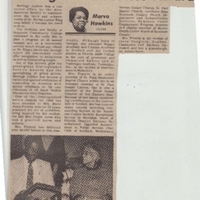 Original newspaper article: Hawkins, Marva Y. "Heritage Jubilee Honors Distinguished Service Award." The Sanford Herald: Private Collection of Daphne F. Humphrey. Digital reproduction of original newspaper article: Hawkins, Marva Y. "Heritage Jubilee Honors Distinguished Service Award." The Sanford Herald. Marie Jones Francis Collection, Georgetown Collection, Sanford Collection, Seminole County Collection, RICHES of Central Florida. Originally created by Marva Y. Hawkins and published by The Sanford Herald. Copyright to the resource is held by The Sanford Herald and is provided here by RICHES of Central Florida for educational purposes only. Dickinson, Joy Wallace. “A Very Rich Trail: Florida’s Black Heritage is Celebrated in an Updated and Expanded State Publication." The Orlando Sentinel, February 24, 2008, J1. http://www.tmcnet.com/usubmit/2008/02/24/3287685.htm. Moore, Stacy. "Midwife on Job Here 32 Years." The Little Sentinel, April 4, 1979, 26. Jeria, Michelle. "Sanford'S Birth Place: Marie Jones Francis Delivered More than 40,000 Babies in Her Sixth Street Home." The Sanford Herald, Feb 16, 2003, 1C. Flewellyn, Valada Parker, and the Sanford Historical Society. African Americans of Sanford. Charleston, South Carolina: Arcadia Publishing, 2009. "Oral History of Daphne F. Humphrey." Interview by Julio R. Firpo. Home of Daphne F. Humphrey. April 8, 2011. Audio record available. RICHES of Central Florida. Heritage Jubilee was a concerted effort by the Afro-American Society to commemorate the birth and achievements of Dr. Martin Luther King long before it became the trend to do so. The students and faculty at Seminole Community College combined in the early 80s to plan a program as an annual reunion and as a community activity which would pay tribute to Dr. King's ideals and through which the community could offer recognition to anonymous as well as outstanding people. Out of this interest grew the prestigious Distinguished Service Awards and the spotlighting of gifted artists. Heritage Jubilee has become a varied and spirited celebration of leadership in America with special emphasis on the contributions of all black leaders who are too often forgotten. One of the Distinguished Service Awards for 1988 has been awarded to Mrs. Marie Jones Francis, who for 32 years, practiced the art of midwifery, being inspired by her mother, the late Mrs. Corrie Jones who was a practical nurse and midwife. Mrs. Francis has delivered over 40,000 babies in this community. Although born in Georgia, she attended Hopper Academy and Crooms Academy in Sanford and did further studies at Florida A&M College in the care of premature and immature babies and at Tuskeegee Institute, Tuskeegee, Ala., in the studies of Improvement in Midwifery. Mrs. Francis is an active member of St. Paul Missionary Baptist Church where she is an honorary member of St. Paul Gospel Chorus. She is also a member of the Royal Grand Chapter of the Eastern Star. Because of her many outstanding contributions to the community of Sanford, she has received many awards including Outstanding Service to the American Cancer Society, Exceptional Service to Mankind, Heart of Florida District Sertoma International, Dignified Achievement in Public Service, Pilot Club of Sanford, Meritorious Service Gospel Chorus, St. Paul Baptist Church, certificate from Seminole County Health Department and Rehabilitation Services, Seminole Youth Employment Program Honoree and charter member of Mental Health Center Board of Seminole County. Mrs. Francis is the mother of three daughters, Daphne, Cassandra and Barbara (deceased) and has a granddaughter, Amber Marie. Rufus C. Brooks, left, and Marie Jones Francis are the recipients of the 1988 Heritage Jubilee Distinguished Service Awards. Hawkins, Marva Y.. “Heritage Jubilee Honors Distinguished Service Award.” RICHES of Central Florida accessed April 24, 2019, https://richesmi.cah.ucf.edu/omeka/items/show/2942.